An article in Foreign Policy, “War on Error,” by security analyst J.M. Berger, has created a buzz in Washington these past few days and rightfully so. The article traces the evolution of al-Qaeda over the past 15 years in an effort to change the way we think about the group, and terrorism more broadly. Despite pronouncements here, there, and everywhere about al-Qaeda’s weakness, the reality is that the organization has not disappeared; it has simply changed. What was 15 years ago a “single organization with a clear chain of command” is now a mish-mash of affiliates and other groups “often lumped under the amorphous label of ‘al-Qaeda linked’,” all with varying ties to al-Qaeda Central (AQC). Why? Al-Qaeda Central today is “a movement and an organization in the midst of dramatic structural transformations that is primarily focused on fighting wars and insurgencies,” not carrying out terrorist attacks. And its recruits are “overt soldiers rather than covert terrorists,” and thus have different priorities, which are often more limited than AQC’s broad goal of global jihad against the West. Berger uses the case of Syria to make this point, but the same could be said of Mali, where myriad jihadist extremist groups sought to “capture, gain, and hold territory,” not commit global jihad, though the West, in particular France, was and certainly remains a target, as evidenced by last year’s deadly attacks at In Amenas and Arlit, and yesterday’s kidnapping of ICRC workers in Mali. While the article makes little mention of the Maghreb and Sahel, some of its other assessments similarly apply to al-Qaeda in the Islamic Maghreb (AQIM) and other terrorist groups operating in the region, which have not only had an unclear relationship with AQ Central, but have also witnessed much of the fragmentation/loss of control that Berger describes with regard to AQ Central. Last August, Mokhtar Belmokhtar’s Masked Men Brigade and the Movement for Oneness and Jihad in West Africa, both former offshoots of AQIM, formed a new jihadist group, Al-Murabitoun. With a stated goal of unifying the ranks of Muslims “from the Nile to the Atlantic,” it is clear that Belmokhtar’s group has an interest in cooperating with other groups, but seems less inclined to be under another group’s control, hence the initial split from AQIM in late 2012. This fragmentation has serious consequences for both how we assess the threat of al-Qaeda and how we confront it. In making those adjustments, Berger argues that the US must ask itself whether this shift from terrorists to jihadist war-fighting organizations presents a similar national security threat. And if so, does it matter if they call themselves al-Qaeda or not? At this point, we would argue that it does not matter what al-Qaeda and other like-minded groups call themselves – they still present a national security threat. Rather than focus singly on al-Qaeda, the US should make a better effort to understand each extremist group on its own terms – regardless of what it is called and regardless of its ties to AQC. This sentiment was echoed in Congress, where an Armed Services Committee hearing produced a panel of experts united in calling for a better understanding of the terrorist threat. Altogether, the result of this reexamination could have significant impact on US involvement in the Sahel/Sahara region. By revising our understanding of terror groups and unshackling anti-terror efforts from the increasingly marginalized al-Qaeda Central, the US can re-prioritize for better results where the threat is growing. The fragmentation of the local al-Qaida affiliate, al-Qaida in the Islamic Maghreb (AQIM), does not signal a weakening of the group’s capabilities. The organization’s lack of cohesion probably has less to do with the arrest or killing of commanders and more to do with the growing ambitions of local Islamist extremists tied to the organization’s southern wing in the Sahel to disentangle themselves from the group’s Algerian leadership in the northeast of that country. As the Sahel/Sahara becomes increasingly unstable, such a shift in US policy should result in more attention paid to the region. This should not only cause a scaling up of security cooperation, but increased aid and economic support as well. Overall, it is clear that the US could use more nuance in its understanding of terrorism. Luckily, this month has seen the beginning of an influential conversation among policymakers in DC that can lead to better understanding of the problem, hopefully leading to better solutions and results. Caitlin Dearing Scott is Senior Vice President of Research, Projects and Programs at the Moroccan American Center. 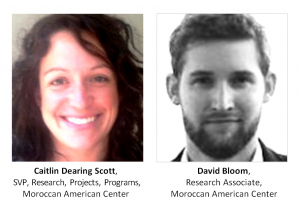 David Bloom is a Research Associate at the Moroccan American Center.